INCAS (National Institute for Aerospace Research) has developed a long-term "Programme of Research and Development for Lighter than Air Aircraft" since 1992. 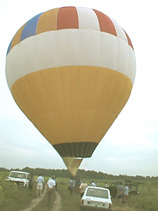 The main purpose of this programme is to design and to manufacture hot air balloons and small, medium size airships. ENVELOPE: Type O-envelope with the volumes of 1600 m3. It is made from rip-stop polyester or polyamide 6.6 with a soft coating of polyurethane. BASKET: It is wickerwork, coated by a protective varnish. The floor is double, made of plywood and is provided with eight supporting cables all made of steel. Maximum crew is 3. 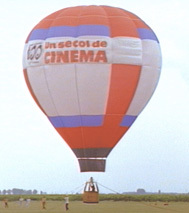 PROPULSION SYSTEM: It includes a burner (P=2,4 kw) and two fuel cylindres made of steel with a volumes of 60 l with propane. ENVELOPE: Type O-envelope with the volumes of 3000 m3. It is made from rip-stop polyester or polyamide 6.6 with a soft coating of polyurethane. BASKET: It is wickerwork, coated by a protective varnish. The floor is double, made of plywood and is provided with eight supporting cables all made of steel. Maximum crew is 6.